The Googie World Expo is a two-day celebration of exuberant and futuristic mid-century modern architecture and design. The first event, on Sunday April 9, will include speakers, vendors, book signings, and an exhibition of 3-D photography exploring the many facets of modern architecture and design. The expo will be held in the hall adjacent to Corky's restaurant (1959, Armet & Davis) in Sherman Oaks and admission is free. Drop in before or after a meal at Corky's or a cocktail in the Cork Lounge. Speakers include Alan Hess, whose landmark book Googie: Fifties Coffee Shop Architecture, renewed interest in the style, and Heather David of San Jose, who will lead us on an expedition of stylish midcentury motels. 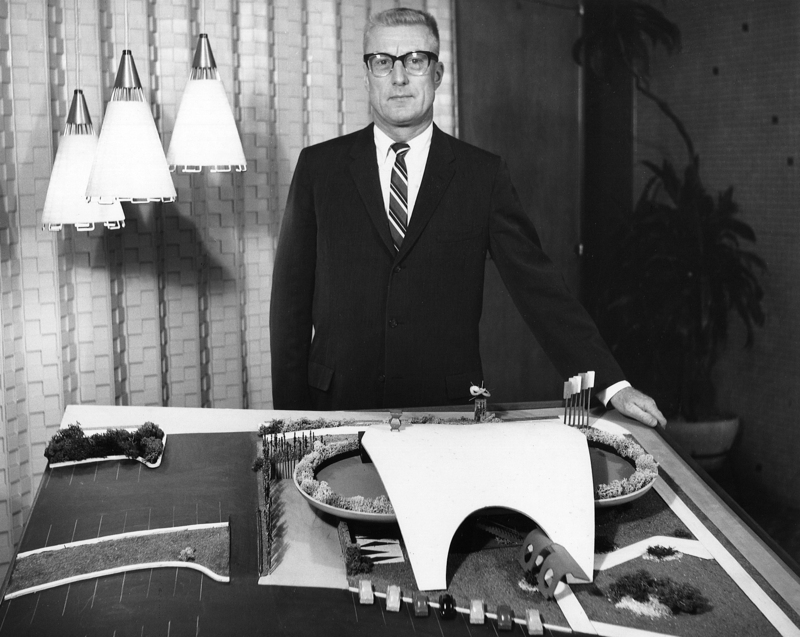 Frank Escher will introduce us to John Lautner and John Eng and Adriene Biondo will take us on a googie road trip. Victor Newlove, longtime partner in the architectural firm Armet Davis Newlove, and Jack Laxer, who has been aiming his stereo camera at L.A. architecture for more than 60 years, will also join us. Admission is free. Then join us again on Saturday, April 22 for a guided tour of the architecture of Armet & Davis. Our luxury motor coach will take us inside the iconic googie landmarks created in the 1950s by the masters of the style. We will visit their historic buildings, including a glorious church, bowling center, coffee shops (including one currently being restored) and the current offices of Armet Davis Newlove, which is celebrating its 70th anniversary. Experts, owners, and designers will join us and share memories of these futuristic places. This one-of-a-kind special tour has a limited capacity so be sure to get your tickets today. Sherman Oaks, CA 91403 Free! 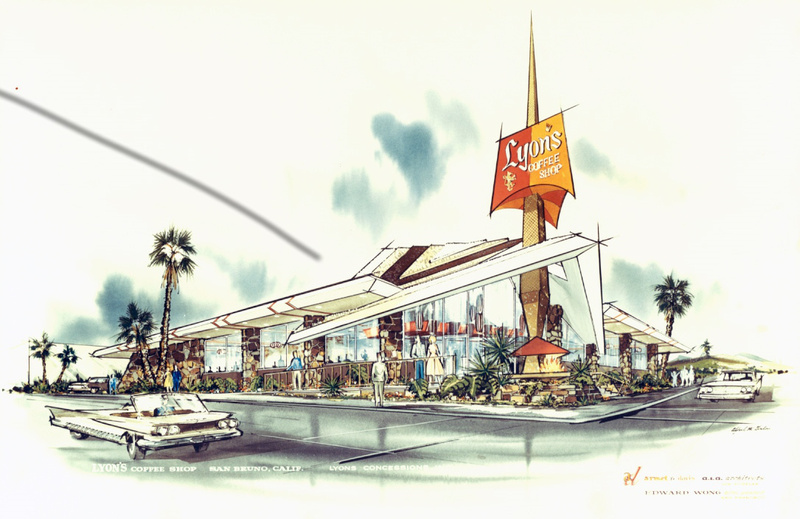 Googie is the exuberant and futuristic mid-century modern style associated with a series of California coffee shops in the 1950s. Historian Alan Hess has dubbed it "ultramodern roadside architecture". The restaurant that inspired the name, Googie's, was designed by John Lautner and opened on Sunset Boulevard in 1949. The tiny café was made of steel and painted orange. It was eye-catching and soon became a favorite of cops and truck drivers, but the young and avant-garde loved it too. Actors like James Dean and Maila Nurmi enjoyed hanging out in the cool, modernist space drinking coffee with friends. Soon, architects began to incorporate walls of glass and shapely rooflines into their designs. 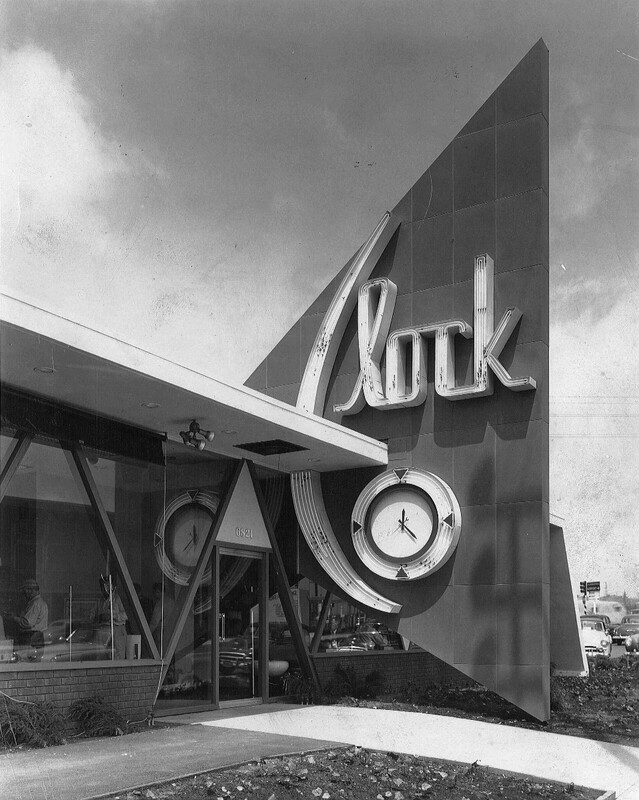 Architects Louis Armet and Eldon Davis wholly embraced googie and created hundreds of restaurants, bowling centers, and cocktail lounges that made potential customers stop and pay attention. Once inside, these were sumptuous otherworldly creations that combined elements of the primitive and the modern. An Armet & Davis coffee shop was often a confection of colorful space-age plastics and rugged flagstone that would rise up out of a tropical garden. The style was repeated in prototypes for Denny's and Bob's Big Boy and quickly spread all over the country. The ebullient lines were so modern that designers in every field felt the influence. It's no wonder The Jetsons was created in Los Angeles. Today the species is all but extinct. Only a few hardy originals survive, but new owners who appreciate the ability of a googie coffee shop to attract customers are rediscovering the genre. Googie's impact has been felt for generations and the Googie World Expo will give you a deeper appreciation for this endangered style. 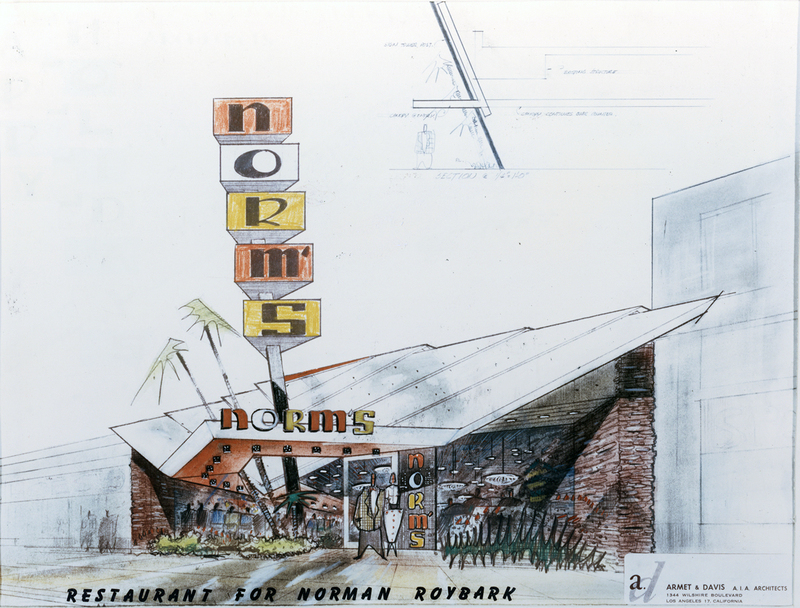 The architectural firm of Armet & Davis was responsible for hundreds of googie coffee shops including Pann's, Norms, and Johnie's. Their signature designs defined the style and spread it across the country. This year marks the 70th Anniversary of Armet Davis Newlove and the centennial celebration of Eldon Davis. Eldon Davis (1917-2011) was born in Anacortes, Washington. He and his partner Louis Armet (1914-1981) both served in WWII and were both graduates of the architecture school at USC. 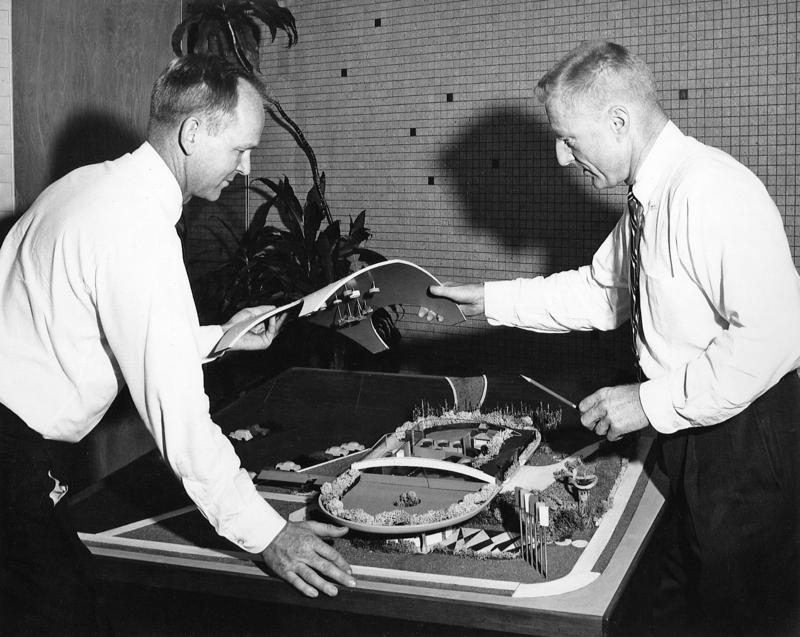 They formed a partnership in 1947 and soon became known for their expertise in designing successful restaurants. 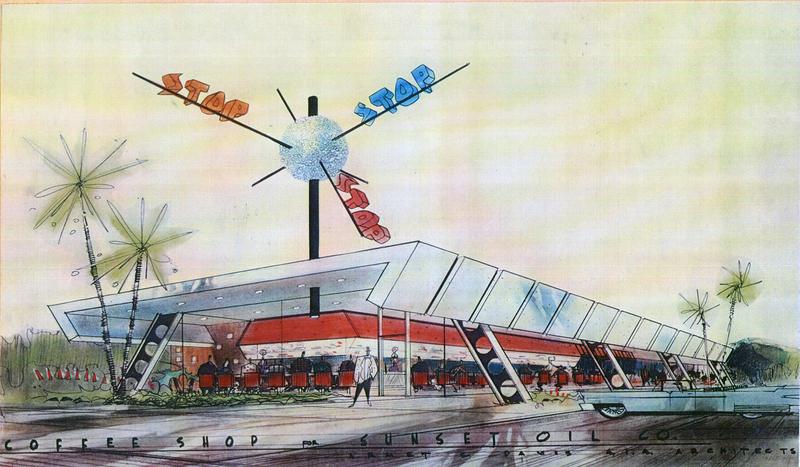 A team including designers Lee Linton and Helen Fong perfected the googie style in the 1950s and created luxurious, inexpensive, all-night coffee shops of the ultimate space age design. Kitchen designer Stan Abrams constantly came up with innovations that made the restaurants highly efficient and photographer Jack Laxer captured them in a series of stunning 3-D photographs. The firm created shopping centers, bowling alleys, country clubs, and a vast number of churches for the new congregations in the booming suburbs. Our tour will visit some of their greatest creations including Pann's and the Wich Stand. We will enter the under-construction Penguin coffee shop with the new owner to hear his restoration plans. We will walk through the soaring sanctuary of one of their earliest churches and make a stop at Holiday Bowl, city of Los Angeles Historic-Cultural Monument #688. 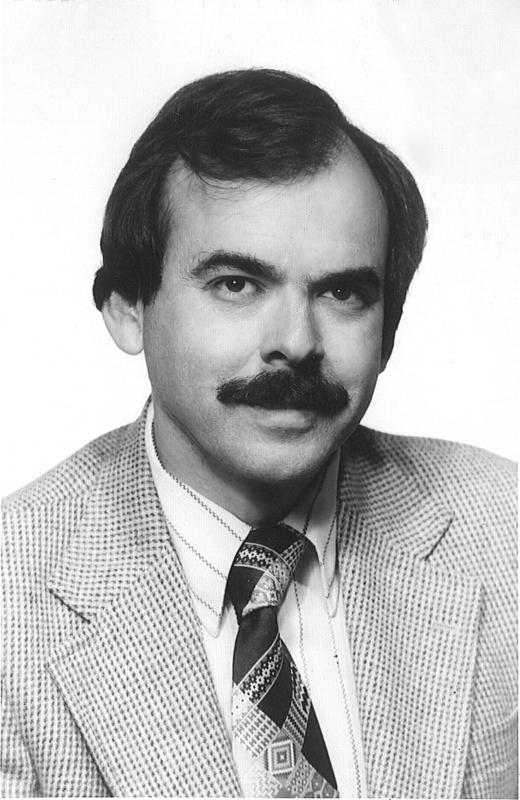 A very special treat will be a visit to the offices of Armet Davis Newlove where we will meet longtime partner Victor Newlove and the architects who are keeping the legacy of the firm thriving in the 21st century. 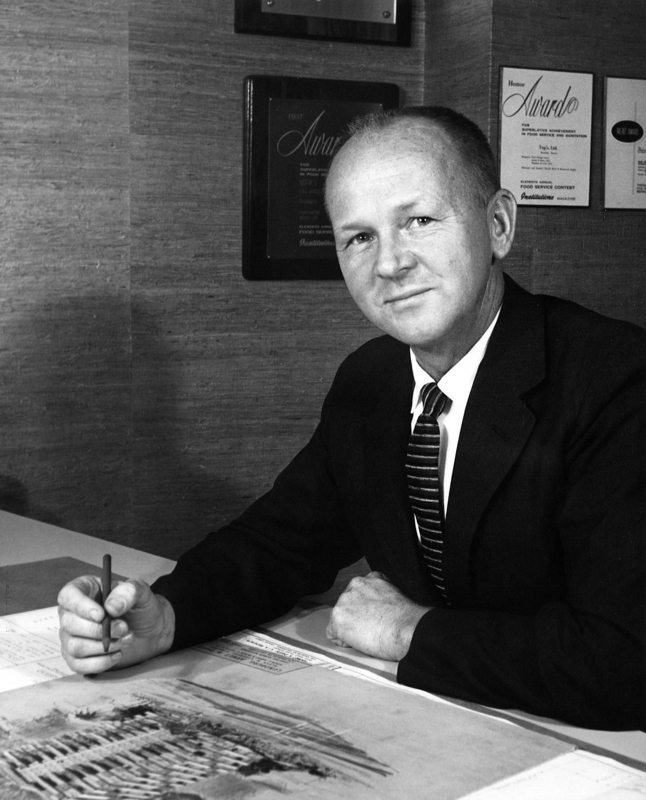 The walls are adorned with original drawings and photographs from the firm's seven decades in business. Please join us for a luxury motor coach tour of the architecture of Armet & Davis on Saturday, April 22 from 1-6pm. Arrive on time, you don't want to miss the bus. TICKETS $60 per person includes bus transportation, snacks and all admissions. Exact rendezvous point in Santa Monica will be sent to you on confirmation of payment. There is free all day gated parking. Rain or shine, no refunds or exchanges. Locations and guests subject to change. Enter at your own risk. SECOND BUS ADDED. Sign up today!